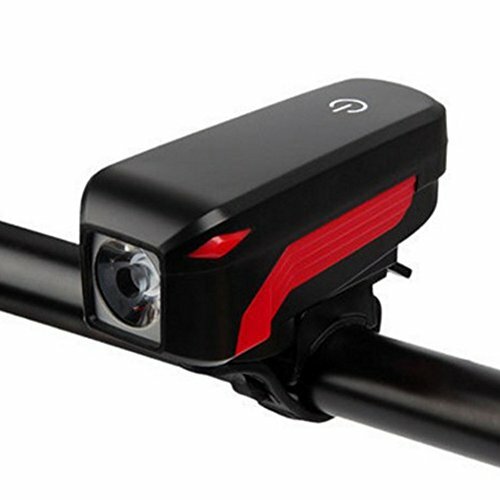 Super Bright Bicycle Headlight USB Rechargeable Waterproof LED Bike Light Touch Switch Light by Isguin at Melon City Bike Club. MPN: 2018ISGUINSPORTBK611. Hurry! Limited time offer. Offer valid only while supplies last. Features: Using T6 LED and 350LM provide you with maximum visibility and extra safety. Four lighting modes from high to low mode meet all your needs. Using T6 LED and 350LM provide you with maximum visibility and extra safety. Four lighting modes from high to low mode meet all your needs. 5 tones high decibel alarm bell with a independent switch for easy use keeping you safer. Built-in 2000 mAh rechargeable battery, support USB recharge. IPX5 waterproof to resist against splashing water in rain. Made from high quality material, it is reliable and durable to use. Advanced silicone mounting strap is flexible enough to fit all kinds of bikes. Low power consumption and lasting endurance.